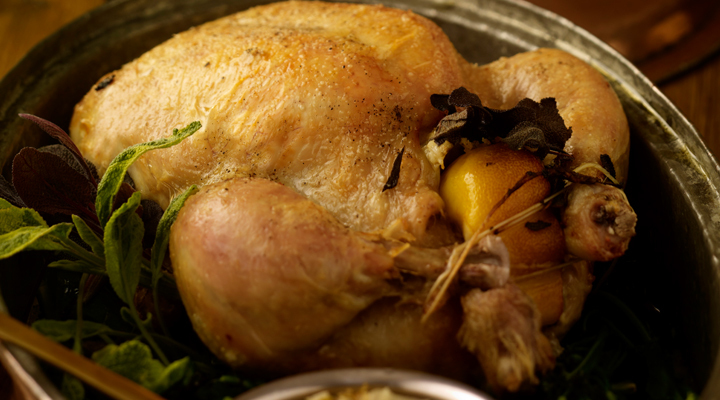 Roast chicken is a family favourite - try adding some lemon or garlic to the basting butter for the most wonderful aromas and flavour. Serve with some roasted root vegetables. Melt the butter in a medium sized saucepan and add in the diced onion. Cook over a very low heat for 5-6 minutes until all of these ingredients are softened completely. Stuff the cavity of the chicken with the cold stuffing, then add half a lemon to keep the stuffing in place and for additional flavour. Place the chicken onto a roasting tray. Loosen the skin of the chicken and taking a little additional butter gently massage the butter into the breasts under the skin of the chicken. Transfer the chicken to the oven and roast for 15-20 minutes. At this stage reduce the temperature of the oven (170C/325F/Gas Mark 3) and cook for a further hour or until the juices run clear from the chicken. The flesh (particularly on the leg and thigh) should feel tender indicating the bird to be cooked.